(Reuters) – The U.S. Food and Drug Administration on Thursday approved Teva Pharmaceutical Industries Ltd’s generic version of Mylan NV’s life-saving allergy injection, EpiPen, at a time when regulators are looking to lower healthcare costs. U.S.-listed shares of Teva jumped 6 percent to $23.88, while those of Mylan were down 1.3 percent at $37.31. EpiPen is a handheld device that treats life-threatening allergic reactions by automatically injecting a dose of epinephrine, also known as adrenaline. 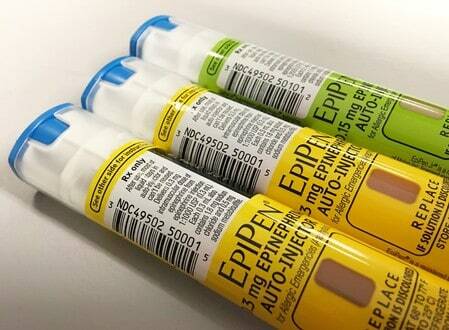 The agency has already approved several epinephrine auto-injectors, including Adrenaclick and Auvi-Q. In addition, Mylan launched “authorized generic” version of EpiPen in 2016. There has also been a shortage of EpiPen in North America, Europe and Canada since earlier this year due to manufacturing delays and the FDA in May added the treatment to its list of drugs in shortage. “This approval means patients living with severe allergies who require constant access to life-saving epinephrine should have a lower-cost option, as well as another approved product to help protect against potential drug shortages,” FDA Commissioner Scott Gottlieb said https://www.fda.gov/NewsEvents/Newsroom/PressAnnouncements/ucm617173.htm. Mylan has come under intense regulatory and political scrutiny over the past few years due to the surging price of EpiPen, which the drugmaker had acquired in 2007 and then raised the prices for the treatment. The company last year finalized a $465 million settlement resolving the U.S. Justice Department claims it overcharged the government for the EpiPen. Revenue from EpiPen has dropped sharply over the last year due to the increased competition and the launch of the company’s own cheaper generic. Mylan last week said its board had set up a committee to review possible strategic alternatives. The Israel-based drugmaker in 2016 failed to get the regulator’s nod for the generic version of EpiPen. “We’re applying our full resources to this important launch in the coming months and eager to begin supplying the market,” Teva said, without providing pricing details. Earlier in the day, Teva said its osteoarthritis-related chronic pain treatment met main and secondary goals during the first 16 weeks of its late-stage trial.